Posts tagged " retirement "
I finished my medical training in 2016, this on top of my training as a pharmacist. I have a plan in place to pay off my student loans in 5 more years. My wife is an engineer but is currently staying at home with our three children. She is planning on going back to school to get a teaching certificate when our children start school so that we can get a nice tuition discount at our parish school. We live below our means, I contribute the max to our 401k and and we drive inexpensive cars. I have read your book (Thou Shall Prosper-loved it) and I tithe around 10% of our net income to our church and various charities. It has come to my attention that we need to contribute around 11,000.00 a year more to “retirement” accounts than we are currently doing. I would like to contribute to a backdoor Roth IRA account automatically from my paycheck every pay period , which means my net income would go down, and I would tithe less. So I am struggling with whether or not it is ok to tithe less but contribute to retirement more, or if I should forgo investing more in retirement until I make more money. We were ready to take a nap by the time we had finished reading of all your personal and professional accomplishments! You and your wife sound like thoughtful, caring and disciplined people. Please allow us to try and rephrase the question you are asking. We think it is one that applies in many different situations. Are we under any obligation to manage our finances in order to maximize tithing? We have been asked similar questions from people inquiring whether they should tithe on pre or post-tax income. As always, we encourage people to ask someone in their own faith family, but we can only say that from the perspective of ancient Jewish wisdom, you tithe on the money you actually receive and that is available for your needs and desires. If taxes reduce what you get to take home, then you do not tithe on the amount that went to the government and that you never received. Is it too late to flourish? At age 65 and as a divorced man, is it too late to be the man God originally intended me to be? I had a pretty successful career financially but never fulfilled the passion and purpose you speak about that men must have. I think after 32 years my wife decided she had better strike out on her own because she didn’t feel I was the man who would provide and protect in the long haul. Together we had built what I thought was a good life and good family. Sadly, I see where I fell short. I have just finished taking care of my ailing mom for two years prior to her recent death at 93. The challenge is now that my assignment is over, and having put my career on hold for 2 years, I am now 65 with the corporate world asking where have you been and why don’t you just retire? I know retire is not in the bible and I still have full energy, capacity and drive to make a difference. My question is at 65 is it too late to be a real man, and fulfill the destiny God has created me for? We can’t wait to see what the future holds for you! If you bring energy, capacity and drive to your work, then you can accomplish a great deal. My (Rabbi Daniel Lapin) own teacher and uncle, Rabbi Eliyahu Lopian, embarked on his most famed and productive work when he was in his seventies. We hope you already know that Colonel David Sanders built up the Kentucky Fried Chicken company between his seventieth birthday and the time he passed on, aged 90. Samuel Walton didn’t get the Walmart company going until he was nearly 50 years old. Raymond Kroc only conceived of the McDonalds vision when he was well into his fifties. And these are just a few of the more prominent examples of people who found their economic niche late in life. There are millions of others who built up successful, if lesser known enterprises after a late, late start. I read an article in the newspaper which mentioned that older workers need to retire at 55 so that young people can get jobs. Am I depriving youngsters from getting jobs? The short and simple answer is NO. The article you read ignores the fact that God created each and every one of us as unique individuals with unique contributions to make to society. Your job is to continue working and adding value to the life of others. God didn’t put Adam in The Garden to work it only until a younger person who needed a job came along. A growing garden means jobs for all who wish to work. What is more, it is a common fallacy to think that a person with years of experience behind him can be replaced by a young first-time-job-seeker. Not true. 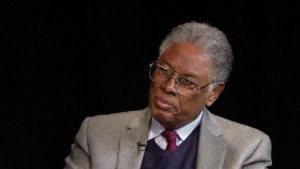 Thomas Sowell, one of the nation’s finest economists and writers has just announced that he will no longer be writing his regular column. If you have not read his articles and books, you are impoverished. Change that. He has the rare talent of explaining complex ideas in palatable bites and the wisdom and insight to understand how the world really works. We hope he will keep writing, even if not on such a regular basis, and appreciate the opportunity to say thank you and God bless to a great American.